This MGM movie tells about a Golden pup who takes off on a magical journey to the wilds of the Australian Outback. Life as a housepet isn't much fun for young Muffin, a puppy who dreams of being a "wild dog." So when he gets his chance to escape in a helium balloon-powered basket, the pup hops on board, changes his name to Napoleon and sets off on his adventure. He meets some special friends who help him as he learns more about the world and himself than he ever thought possible. LOCAL pooches Trooper and Kaleb are heading for the big time. They star in the $4 million film, Napoleon, shot on location in South Australia and New Zealand and now being released. Both dogs play the lead part of Napoleon, a frustrated Golden Retriever who knows he's not cut out for a comfortable city life. Instead, he sets off for the outback and a series of wild and wonderful adventures, including a memorable trip in a hot-air balloon. Trooper is owned by Eden Hill's Lillian Robinson, while Kaleb belongs to Jane Dooly, of Bassendean. 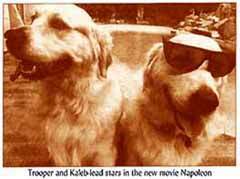 They were the only two dogs from WA to feature in the movie. 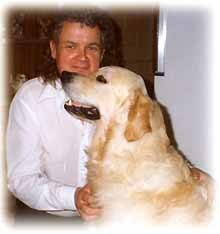 Meet Andy who lives in Perth, Western Australia with his 4-year-old Golden boy, Trooper. Trooper, this adorable pup here, grew into the handsome lad pictured below. Andy's family got their wonderful boy Trooper from Lillian, a family friend. He is the best thing that has happened to their lives, and has opened up their hearts. His love is so unconditional. He loves the special time Andy's family spends together in the garden when he is eating his supper. Night time is another ritual Trooper enjoys. All have a hug, and then Trooper hops into the bed --- in the middle of course! Trooper is a very special boy! Recently (January 1999), Andy's family was very lucky as Trooper was able to warn them that something was very wrong. Andy had just had a stroke and collapsed. But, Troops actually ran into the house and alerted the family that something was wrong. Andy was first treated at the Royal Perth Hospital, but is now recovering at a rehabilitation center where he will have to remain until sometime in May. Andy is in fact a young man, but he had a brain tumor a couple of years ago, and never fully recovered from that, his speech and balance still affected. Now, due to the stroke, he will need to be in a wheelchair. Before the family got Trooper, Andy had spent six months in his room. But, Trooper has changed his life, and that of Andy's parents as well. Now, Andy has become social again and has so much confidence when Trooper is beside him. Being such wonderful buddies, Trooper and Andy were very much missing each other. With lots of encouragement from many Golden lovers across the world, Trooper was allowed to visit with Andy at the rehabilitation hospital. And, he has worked wonders. Just look at how happy Andy looks in the picture above with Trooper. This was a picture that was actually taken at the hospital when these two buddies were reunited. There are many patients at this same hospital who could benefit from the healing powers of this amazing Golden Therapy Dog. So, the hospital has now welcomed Trooper visiting on a daily basis. They take patients out into the connecting gardens in wheelchairs and even hospital beds to interact with Trooper. He has, of course, become a big hit. And, Lillian says he is so very good and gentle. Laying on the grass in these gardens, he allowed two little birds to come very close to him. Then, he merely watched as they merrily ate crumbs from some cake. Recently, Trooper has helped another young man at this same hospital. Although only 19 years of age, Clinton is terminally ill with Muscular Dystrophy. Well, he was so scared of dogs before meeting Trooper. So, Trooper was very wise and took his time. Soon, he let this new friend know that he was just a perfect dog, and certainly okay to stroke. And, by the end of the visit, Clinton was merrily stroking Trooper and laughing at him.